The bite of the paralysis tick can lead to a deadly meat allergy - and Sydney's Northern Beaches is infested with them. Janelle Williams has always been able to eat meat, until it nearly killed her one night five years ago. Janelle suffers from acute mammalian meat allergy, and has an extreme reaction to all mammal meat, dairy, and related products. Common goods from fruit juices to hair products often contain animal by-products. "I have to be very careful when I go out to make sure I'm not going to a restuarant where there are meat fumes. I certainly couldn't go to Bunnings on the weekend when there's a sausage sizzle. "It's just such a scary, scary situation - thinking that your life could end with the next thing that you eat." "... an epidemic of non-communicable disease"
Janelle and a growing cluster of Australians are developing an allergy to red meat after being bitten by ticks in Sydney's northern beaches. 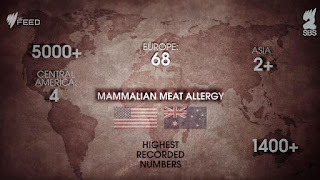 The specific allergen is alpha-gal, a carbohyrate in all mammal meat, and it is associated with the bite of the Australian paralysis tick, which causes paralysis in household pets, but in humans can lead to the deadly allergy. Associate Professor Sheryl Van Nunen was the first to make the connection between tick bites and developing mammalian meat allergy. She saw her first case in 1987, and very occasionally over the next 15 years, but in 2003 it became "an epidemic of non-communicable disease". "It doesn't appear to happen in people who haven't been bitten by tick. The reaction ranges from mild stomach discomfort to severe and life-threatening anaphylaxis. Van Nunen estimates that there "has probably been one death". Australia and the US have the highest incidence of the allergy in the world. 70 per cent of Australian cases are found in Sydney's Northern Beaches which has become the world hotspot for red meat allergies. In this area the allergy affects more people than peanut allergies. Van Nunen points to a handful of reasons for the cluster - increased population in the area, more people doing outdoor activites like gardening, and a climate that is conducive for the ticks to breed. Kevin Broady, an immunologist, identifies the grassland around the area as a perfect habitat for the tick. "The host is essenially any warm blooded animal. "They're a bit like the cockroaches. They'll be there after the nuclear bombs go off." The native host of the paralysis tick is the bandicoot. Some believe that the local population has exploded since fox culling began, and the tick population has increased with it. Bandicoots infest the backyard of Suzie Maher, a local resident whose son Liam is the youngest known sufferer in Australia. 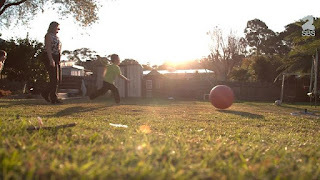 He contracted the allergy last year when he was just three years old. Liam was nearly killed after eating a plate of spaghetti bolognese, a meal he'd eaten a hundred times before. 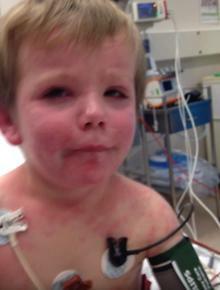 Covered in a red rash and having difficulty breathing, Liam was rushed to hospital. "As a mother watching that on your child is horrific," said Suzie. "It's the most frightened and upsetting I think I've ever been. "We didn't know what was happening. We didn't know where this had come from." Liam's first reaction, triggered by spaghetti bolognese . In the past six months, three other students from Liam's school have been diagnosed with mammalian meat allergy. "They're popping up everywhere," she said. "I'm terrified that my girls will get it. I'm terrified that I will get it," said Suzie. "I like to eat meat." "It's been suggested at one point we should move, but we love it here. We love the area we live in." There is no known cure, so prevention and proper removal of ticks is crucial. There is a possibility that Liam will grow out the allergy as he is so young, but Janelle does not hold similar hopes for herself. "The reality is I need to tell myself I'm going to live with it for the rest of my life," she said. "And just try and make people more aware of it and hopefully save someone's life."